It’s been two months since we moved to our new home in Federation House – a space designed and built with inclusion at the very heart. When we started planning the move, we had one very clear aim – to create an accessible, welcoming and safe space for everyone who uses it, be that our colleagues, clients or communities alike. We learnt a lot along the way, including the importance of facilities such as gender neutral toilets, baby changing facilities and quiet spaces for meditation, reflection or prayer. But what really makes an environment truly inclusive? How can we ensure that people feel valued and supported in reaching their full potential? What can we do to help balance our own needs, as well as those of others around us? Ask questions & listen, non-judgementally – understanding the needs of others is crucial to building an inclusive environment. Be open minded and interested, ask questions to understand what people need and how you can best support them. If people need reasonable adjustments in the workplace, make it happen. If they have preferences of which pronouns they wish to use, respect their wishes. If people need some time out, work with them to help find a solution. Change our language to tackle stigma – we need to change peoples preconceived ideas about historically stigmatised topics and, in order to do that, we must change the way we talk about them. Everyone has mental health, just as everyone has physical health and it should be addressed as such. Likewise, neurodiversity isn’t about focussing on labels and more a case of recognising the benefits of different thought processes and thinking styles. Be visible & have a voice – role models play a vital role in encouraging and inspiring others. We need to relate to people and seeing them succeed helps us to believe we can be successful ourselves. Be bold and brave in standing up and tackling injustice. Be part of the change you want to see and and help support others by providing platforms through which their voices can be heard. Encourage conversations & educate others – it’s OK to not be OK and it’s OK to talk about that. In fact, if more of us did, it wouldn’t seem like such a big deal, right? We have a responsibility to create a culture around openness and empathy, advocated by leadership and championed throughout. Being comfortable with showing your vulnerability can be difficult but it’s really important and having the courage to talk about your experiences will help show hope to others in times of adversity. 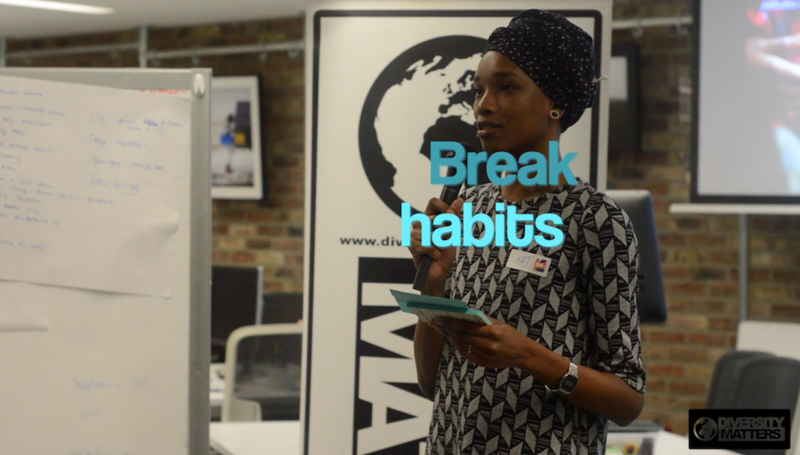 Be self-aware, patient & flexible – when working in diverse teams, the traits and behaviours of those around you will likely be different to yours. Be mindful of this and don’t let your own ego get in the way of working effectively with your colleagues. Check yourself if your patience is waning. Be patient, understanding and kind. Challenge traditional working practices that don’t recognise different thinking styles – offer flexible working, ditch unhelpful processes like psychometric testing and recognise how different working styles can compliment each other. The key to diversity & inclusion is having the right mindset. Barriers faced by people are rarely specific to just one group so it’s essential that appropriate options are offered to accommodate peoples often complex and changing needs. Be thoughtful about others, bring different voices, experiences and perspectives to the table and let’s keep the conversation going! ← #DMSpotlight: Brexit doesn’t mean we should lose our “Black in Europe” solidarity!